What iPhone hardware feature or accessory do you want most? In total, 356 people sent valid responses by our deadline, where valid means “a legitimate software feature that isn’t already available via the stock features of the iPhone or iTunes.” (Trust us, the iPhone will ever wash your windows, do your laundry, or make you an espresso—all feature requests we actually received.) We also told followers that MMS and tethering were not valid responses; these features already exist, but some individual carriers—*cough* AT&T *cough*—aren’t yet supporting them. Finally, if a person submitted multiple answers, we took only the first one. Hey, we were clear that we wanted the #1 missing feature. 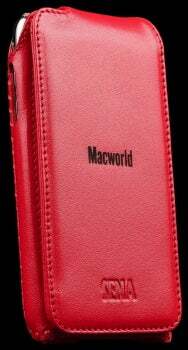 We picked a random respondent, @melvinwalker, to receive a thank-you gift: a custom-made, Macworld-logo, red Sarach Flip Case. His feature wish? To be able to sync only particular notes instead of having to sync all of them. 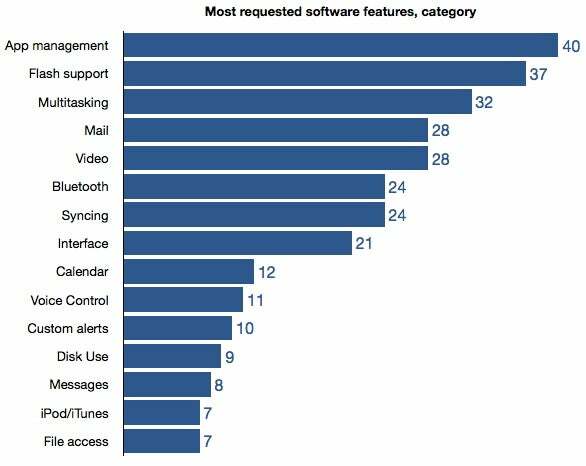 Once we performed that bit of data cleaning, there were 15 specific features that received six or more votes (see the chart, below). 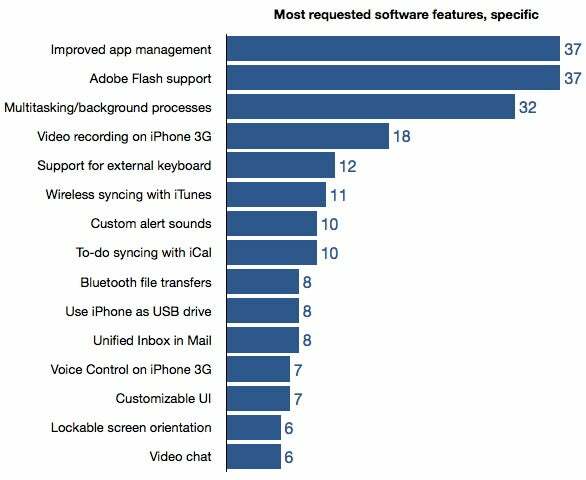 Not surprisingly, the top three features, by far, were better app management, support for Adobe Flash, and multitasking (aka, the ability to run apps in the background). Interestingly, many of those aching for a better way to deal with all their installed apps—Macworld’s Twitter followers have a lot of apps on their iPhones—offered suggestions for doing so, and those ideas were all over the map. Some want folders and categories on the phone itself, while others would be satisfied if they could move apps between “screens” within iTunes and then have those changes synced to the iPhone. Similarly, the people hoping to be able to run apps in the background vary widely in exactly how they wanted that implemented. A few want Palm Pre-like true multitasking, whereas many just want to be able to listen to Pandora while doing other things. We’ve got one survey left this week, and it’s happening today. If you’d like to participate, you can follow @macworld on Twitter; we’ll be posting the question of the day around 10am PST. We’ll also be randomly picking another (US-resident) respondent to receive a custom, Macworld-logo iPhone case.